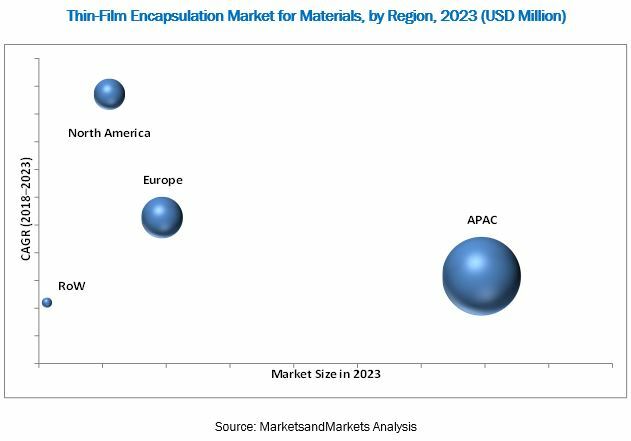 [104 Pages Report] The thin-film encapsulation (TFE) market for materials was valued at USD 13.1 Million in 2017 and is expected to reach USD 101.1 Million by 2023, at a CAGR of 26.1% during the forecast period. The base year considered for the study is 2017, and the forecast period is between 2018 and 2023. This report provides valuable insights on the ecosystem of the thin-film encapsulation market. The leading suppliers of TFE equipment and materials in the market are Samsung SDI (Novaled) (South Korea), LG Chem (South Korea), Universal Display Corp. (UDC) (US), Applied Materials (US), 3M (US), Veeco Instruments (US), Kateeva (US), Toray Industries (Japan), BASF (Rolic) (Germany),; Meyer Burger (Switzerland), Aixtron (Germany), Bystronic Glass (Germany), AMS Technologies (Germany), and Angstrom Engineering (Canada). Key innovators profiled in this report include Beneq (Finland), Encapsulix (France), Lotus Applied Technology (US), Vitriflex (US), and Picodeon (Finland). With the given market data, MarketsandMarkets offers customizations according to the company’s specific needs. The following customization options are available for the report. Thin-film encapsulation (TFE) is barrier implementation process used in preventing moisture and oxygen permeation into electronic devices. The encapsulation process has a great impact on both the lifetime and reliability of electronic products. Different technologies such as atomic layer deposition (ALD) and inkjet printing can be used for the encapsulation of flexible OLED displays and lighting products, thin-film batteries, photovoltaic solar cells, and others. Technological innovations, rising investments, and IP protections have significantly impacted the TFE market over the years. Reduced device thickness, low cost, and weight in combination with improved flexibility and robustness are the major benefits offered by TFE technology. The newer technologies such as atomic layer deposition (ALD) and inkjet printing are expected to impact the market during the forecast period. The cost of the raw material license, cost of equipment, and optimization in various processes have further steered the TFE market. The thin-film encapsulation market for materials is estimated to be worth USD 101.1 Million by 2023, growing at a CAGR of 26.1% between 2018 and 2023. The major factors driving the growth of the market are the rapid adoption of flexible OLED displays for smartphones and smart wearables and need for thin-film barriers in flexible and organic devices. The rise in the adoption of high-efficiency thin-film solar cells; huge investments in building OLED manufacturing facilities; and expected roll-to-roll production of OLED lighting are likely to create lucrative opportunities for thin-film encapsulation technology and material providers. The development of flexible glass acts as a restraint, whereas the essentiality of technical knowledge and need to protect intellectual properties pose major challenges to market players. There are 2 major steps of thin-film encapsulation, i.e., the deposition of an organic layer and inorganic layer. Technologies used in the production of thin-film barriers include PECVD, ALD, inkjet printing, and others. Plasma-enhanced chemical vapor deposition (PECVD) is one of the techniques allowing industrial-scale deposition of good-quality insulating films, such as silicon oxide and silicon nitride with good adhesion. PECVD is cost-effective when used for mass production and can be performed at low temperatures. Major companies in the thin-film encapsulation market that produce deposition equipment based on the PECVD technology are Applied Materials, Meyer Burger, and Aixtron. ALD is an attractive thin-film deposition technology because of its precise control over the thin-film thickness and its ability to produce uniform films over large areas. This type of deposition process works at the low process temperature. Companies such as Samsung Electronics and LG Display are increasingly focused on adopting the ALD-based equipment for depositing barrier films. The ALD-based TFE equipment are manufactured by companies such as Veeco Instruments, Lotus Applied Technologies, and Encapsulix. The inkjet printing is expected to revolutionize the TFE technologies for organic layer deposition. Kateeva is the leading manufacturer of inkjet printing equipment for thin film encapsulation. 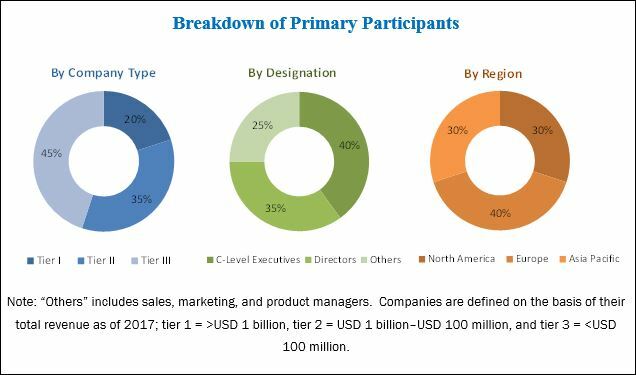 The thin-film encapsulation market for materials has been segmented on the basis of application into OLED displays, OLED lighting, thin-film photovoltaics, and others. OLED displays witnessed high demand for TFE materials in 2017. Samsung SDI and LG Chem develop thin-film encapsulation materials for flexible OLED displays. These companies are also working with thin-film encapsulation equipment suppliers such as Kateeva and Applied Materials. The thin-film encapsulation market for materials in OLED lighting applications is expected to grow at the highest CAGR of 31.8% during the forecast period. North America, Europe, Asia Pacific, and RoW are considered the main regions in the thin-film encapsulation market report. Various market players have a positive outlook for the thin-film encapsulation market in APAC due to the presence of industry-leading customers, such as Samsung and LG Display. The European region has presence of OLED lighting manufacturing companies, and North America has presence of various solar cell developers. APAC accounted for the largest share of the thin-film encapsulation market for materials in 2017. Major display panel and brand product manufacturers are based in China, Japan, Taiwan, South Korea, and Hong Kong. South Korea accounted for 74.2% of TFE market for materials in APAC in 2017 owing to presence of industry leaders, such as Samsung and LG Display in the country. Further, the demand for thin-film encapsulation materials from China is expected to increase rapidly during 2018–2023 as various Chinese players such as BOE Technology and CSOT are planning to construct facilities to manufacture flexible OLED panels. The growth of the market in Europe is driven by factors including the increasing adoption of OLED lighting solutions in the automotive industry and government support initiatives for OLED lighting research. OSRAM is a leading player in the region. The leading suppliers of thin-film encapsulation equipment and materials in the market are Samsung SDI (Novaled) (South Korea), LG Chem (South Korea), Universal Display Corp. (UDC) (US), Applied Materials (US), 3M (US), Veeco Instruments (US), Kateeva (US), Toray Industries (Japan), BASF (Rolic) (Germany), Meyer Burger (Switzerland), Aixtron (Germany), Bystronic Glass (Germany), AMS Technologies (Germany), and Angstrom Engineering (Canada). Key innovators profiled in this report include Beneq (Finland), Encapsulix (France), Lotus Applied Technology (US), Vitriflex (US), and Picodeon (Finland).